SB 111 would legalize land-based and online sports betting in Ohio. The proposal has heavy bipartisan support in the Senate. The bill would tax sports betting at 6.25% and create several new state funds. COLUMBUS, Ohio – Last Thursday, Ohio finally unveiled its legal sports betting legislation. This comprehensive proposal is a series of revisions and additions to the existing Ohio Revised Code (ORC), which would both legalize sports wagering and establish the government’s taxation and oversight models for the industry. 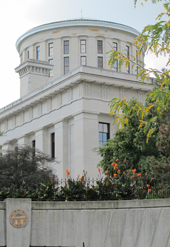 The bill originated in the Ohio Senate as SB 111, sponsored by Sens. John Eklund (R-18) and Sean O’Brien (D-32). With heavy bipartisan support and reports that the governor might be including sports betting revenue numbers in his annual budget (to be released Tuesday), chances seem very good that this bill will be passed into law during the current session. Under the terms of the bill as offered, legal Ohio sports betting will be limited to the state’s existing casino and racino venues. There are four land-based casinos and seven racino venues in the state. Each of these will be allowed to operate its own sportsbook service. In order to become and remain licensed, a prospective bookmaker must submit to the Ohio state government an annual licensing fee of $100,000. Taxes are to be collected on sportsbook gross revenue at a rate of 6.25%, which would be – so far – the lowest such rate in the country. There is no indication of why these funds are being created with sports wagering proceeds, given that all seem outside the purview of sports betting administration in general. This is evidence that SB 111 is at least ancillary related to the broader scope of gambling in Ohio. The bill sets the legal minimum age for sports betting at 21 years old, and there are no allowances in the language of SB 111 for the extraction of any “integrity fees” payable to sporting leagues. Does SB 111 Allow Online Sports Betting? Yes, SB 111 indeed allows for online sports betting. Under the terms of the proposed law, each brick-and-mortar gambling facility would be empowered to offer a branded online betting portal/app. Gambling venues would have the option of rolling out their own in-house product to offer online sports betting, or they could partner with existing bookmaking operators for this purpose. Advertising limitations are not explicitly discussed in the bill, though given the age controls in the industry, ads will not be allowed to target minors or gambling addicts. Bettors are not compelled to sign up at their sportsbook(s) of choice in person under the proposal. Remote account creation should assist in spreading the reach of legal Ohio sports betting. This, in turn, will help maximize the state’s revenue opportunity from the pastime. A Curious Side-Note: What Is Bookmaking, Exactly? Per § 2915.01(B), “bet” is then defined as you’d expect, except that it “does not include sports wagering as permitted” by SB 111. As such, SB 111 effectively states that bookmaking is not related to sports betting. Whether or not this opens the door to future legal loopholes that encourage under-the-table or gray-market sports wagering in the state is unknown. Still, even with a cursory reading of SB 111, this is the aspect that most jumps out. It will be interesting to see what consequences arise from this redefinition, even if those are limited to an academic perspective.